This is part 2 of the Minnie Moms' response to Windy, who was looking for help dealing with tired kids at Walt Disney World. Janine: Although we haven't been to WDW yet with Felicity (F), we have had plenty of long days out both here in England and on our vacation in France. As F is only 8 months old, I have to say that at this age we tend to let her dictate our travel plans. She still has both a morning and afternoon nap (usually) so often we time our outing around this. For example, if it is a short journey somewhere, then we let her sleep and then go out afterwards, or if the trip itself takes more than, say an hour, then we time leaving the house to coincide with nap time so that she sleeps in the car on the way there. She'll generally be pretty good for a few hours this way and won't get cranky again until it is time for her afternoon nap. Again this may mean leaving where ever we are so that she sleeps in the car on the way back. 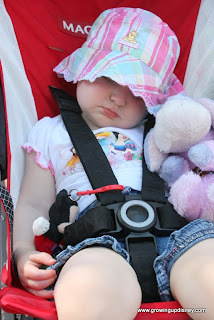 When we had the buggy in pram mode - with F lying down (up to about 3 months) she would also happily nap in there while we went out. Alas, now that she is sat up in the buggy (stroller style) and forward facing, she is way too nosey to drop off no matter how tired and cranky she is! F is quite choosey about how and where she will fall asleep too. As I am still nursing, her favored place to sleep is while feeding. This can be met with all sorts of problems if she does not get to do this. We have even had to stop a car ride when she has refused to sleep, so I can nurse and she has dropped off straight away! If I was in WDW this would not be a problem of course. Nursing is not an issue in the parks and I have spoken to many moms who say Disney is a pleasure to feed in. There are of course the baby care centers with comfy rockers (as mentioned already in an article by Amy) or indeed many moms have told me that they have nursed on rides! No not TOT or one of the mountains, but places like Ellen and Great Movie Ride are perfect! When we do go to WDW, hopefully in 2014 and possibly to DLP before that, we will still work to incorporate Fs nap if she needs one with our schedule. We also plan to stay onsite so that we can go to the parks at rope drop when F is quite lively anyway, return to the hotel for a rest (a nap, swim whatever is needed) and then return to the parks later for dinner and fireworks etc. We have already decided that we won’t push nighttime activities when she is young. Yes it would be great to see Wishes and Fantasmic, but if she so tired that she's not enjoying being there, then that'll just be something we save for a return visit. Of course, this is all geared at a small child. For parents with older children who still get tired after a long day, I would suggest almost the same plan as DH and I have had when touring the parks as a couple and with our parents. That is that we all have something we really want to do, so we head to that ride, get fast passes etc and everything else is a bonus! Especially being pregnant in the parks last year I really learnt the importance of doing a ride and then resting up or choosing a sit down and relax attraction such as The Hall of Presidents where you can recover and cool down in between queuing for popular rides. That and factoring in plenty of rest stops (especially if you're on the DDP and can use up your snack credits) to keep you and the kiddies well hydrated and full of food for energy. I mean, really, what better excuse is there to HAVE to go to Main Street Bakery for one of their famous cinnamon rolls, go on - you need your energy! A very short extra tip for DHs - mine always takes a newspaper (something like Sports Weekly) into the parks. This means while I'm off pin searching or suchlike, he can sit on a bench and read up on the baseball scores. Next time we'll hopefully be taking an iPad or iPhone also so he can use that too! Kelly: The theme here for us is that everyone gets to do things that are important to each member of the family. This keeps the crank away in my family….well most of the time anyway. • I like to get up early and hit the parks and then take a break during the day. We go a lot in the summer so the kids do not miss school and it is very hot. This way we get out of the heat and recharge before going back to the parks for a late night. • We will each take one of the kids somewhere they want to go and make it all about them. I usually take Anthony, my six year old, and we do things that he wants to do that my eleven year-old couldn't care less about. My husband, Chris, will then take Shawn out and do the same. This way the boys get some time away from each other, which they need sometimes. • We plan a day where we will sleep in and take it easy; sometimes we don’t even go to the parks. • We plan a day at the water park and then some time that night at Downtown Disney. • We plan a night to go thru all the shops at Epcot and also have some of the snacks and drinks in each country while the kids do the masks and passports at the Kidcot Stations. • If we get a 2 bedroom villa, I like to order some food and snacks this way everyone has those things that they really like. Shawn really loves bagels in the morning…. • I make sure I pack everyone’s favorite clothes and hats. 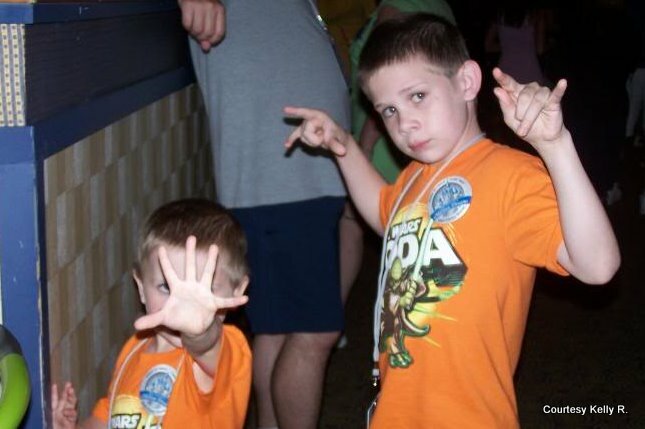 They are boys but still if I don’t have Anthony’s Star Wars t-shirt it’s going to be a tough vacation. • I let the kids bring books, games and other things that help keep them happy. It comes in handy on a rainy day or even at the airport if there are any delays. Amy: All of the other ladies have provided such great tips that I will keep mine simple. For Audrey, we try to work naptime into the day’s activities. If we’re traveling, we try to be on the road at a normal naptime. 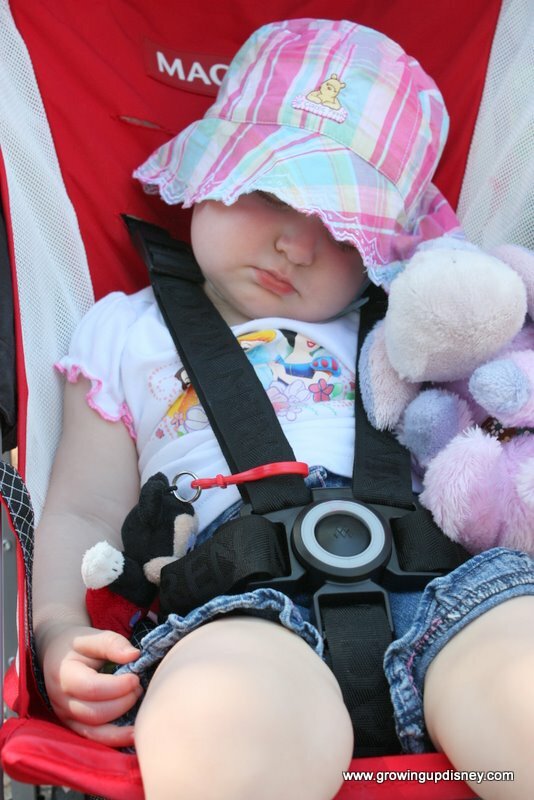 If we’re at Walt Disney World or any other full-day activity, an after lunch stroll can allow for naptime. In April, she had just turned a year old and took two short naps a day, usually in her stroller. We’re going back in October and we’re down to one nap a day. The one nap is normally about two hours, so we may need to go back to the room. We’ll stay flexible and see what works best for her. Flexibility is key with toddler travel. We went to a Scottish Festival here in town recently and arrived right about naptime. Audrey stayed awake almost until we left and then had a short nap and went to bed early. We’re planning on eating lunch a little earlier than usual on our upcoming trip. A tired and hungry kid (or grown-up) is no fun! I’d rather Audrey eat a little less at an early lunch than have a meltdown because we waited too long. There are plenty of opportunities for snacks if she needs one in the afternoon. I try to carry kid-friendly foods in our backpack. There’s no need to stick to a strict schedule on vacation, but you’ll pay if the kiddo stays up late every night. Thanks to our Minnie Moms for sharing such helpful tips! If you have a question for us or a topic you'd like us to cover, please leave a comment or email Amy. What ideas do you have to keep your travel party (kids or adults!) from getting over-tired while on a Walt Disney World vacation? I REALLY like the idea of picking a theme, or a "most important" thing each person wants to do at the Park, and focusing on that. Beth, thanks! We, like you, have breakfast in the room. We're DVC so we have a kitchen, which helps. On the upcoming trip, we're staying at SSR and ASM. For the cash portion of the trip, we got a family suite so we'd still have the kitchenette. Saves time, money, and gets the day off to a good start. We're going to do more counter service meals when we go next month. Disney's fast food is pretty good and for now, speed and convenience are more important than cuisine. We've been before and we'll be back so we'll all adjust to the kiddo while she's small. It won't be long before she's old enough for a little more wait. A couple times earlier this year, if we were at Magic Kingdom we rode the train around, sometimes we hopped the monorail. It was relaxing for him and he would fall asleep. Yay!! More great ideas for the upcoming trip. @Kelly, I love the one on one idea of touring with a single child. We do this each Tuesday night with our 4 YO and it is working wonders. I have pass on the site to a friend leaving for WDW this week for some timely advice. Make that I "passed" on the site as they are doing F&W and also NSSHP next week after I talked them into both.